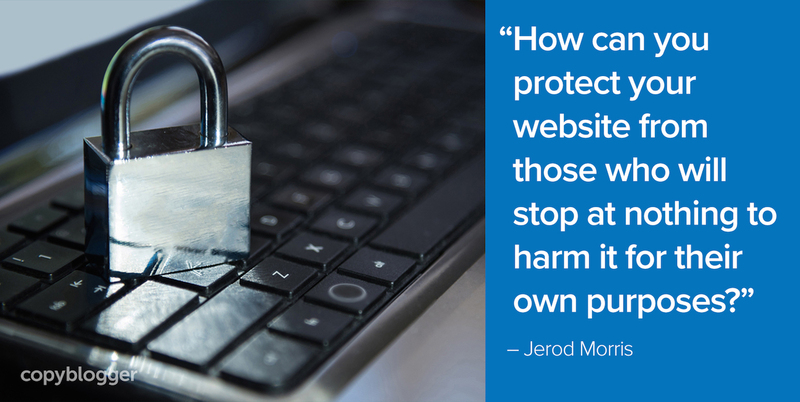 Website security has never been more critical. Hackers, ransomware, and denial of service attacks are all concerns for modern business websites. Even worse, have you ever navigated to a site, started reading, and then been suddenly redirected to some spammy, shady-looking sweepstakes page? Or worse … you try to press the back button, and you can’t? I have. It’s a pretty good sign that something got hacked on the original site, whether it was the site itself or a piece of code, like an ad script. It definitely makes me think twice about visiting again. So, how can you protect your website from the evildoers who will stop at nothing to harm it for their own nefarious purposes? The first step below is the most important. What does my host bring to the table in terms of security? Well, a strong host should essentially take care of the rest of these steps for you. Sounds like a pretty sweet deal, right? Absolutely. You don’t want to stress about security; you want to work on your content to build relationships with your audience members who will hopefully become future customers. So, let’s look at these other steps and see what your hosting provider should deliver to you. To see which hosting providers we recommend, check out our comprehensive guide to WordPress tools and plugins. But it’s generally up to you to make sure you update your version of WordPress when there are problems with a previous release. This means you have to keep track of when WordPress updates are available, back up your site, and then cross your fingers that the update doesn’t bork something. And then do it again a few weeks later when a new update is out. That’s cumbersome. And it can be stressful. But it’s necessary. The best solution is hosting your site with a provider that has an automatic update feature — and to turn it on, if it’s not on by default. Then, your host essentially takes this responsibility and pressure off your plate. That’s good. That’s the value you pay for. The next question is will the themes or plugins you want to install add security holes? If your host comes bundled with themes and recommended plugins, then you can feel confident that everything will play nicely together and be as secure as it can be. Take the Genesis Framework, for example. This is the framework on which all themes are built at StudioPress. Plugin security is important too. First you must carefully select which plugins you allow into your site’s environment, and then monitor those plugins to make sure they are always updated to the latest version. Plugins can be the blessing and the curse of WordPress, and you want to stay vigilant about keeping them updated at all times. Now let’s discuss two more areas where you and your hosting provider need to be really serious about security. You’ve probably heard the term, even if you didn’t know what it means. A distributed denial of service — DDoS — is a brute force attack that is the result of multiple compromised systems (for example, bots) flooding your site with traffic. You need to make sure that your site’s host has proactive technology that allows it to detect and mitigate attacks quickly, while repeat offenders are detected and banned accordingly. Good WordPress hosting will probably have some kind of proprietary technology in place for this — something like an “always on” intrusion prevention technology that works continuously to keep your WordPress install safe from vulnerabilities, intrusions, and exploits. You would be wise to ask your host how they handle DDoS attacks, and you should hope they have a detailed explanation. DDoS attacks are a serious problem, and they need to be treated with serious solutions. Unless you constantly monitor all of the folders and files that make up your website, how will you know if a hacker has broken in and left something? Not all hacks and malicious code reveal themselves immediately in a public, obvious way. And if your site has a ticking time bomb buried within it — really, if it has anything in it that you didn’t put there yourself — you need to know about it so you can take action. Many WordPress hosting providers partner with Sucuri for continuous malware monitoring, scanning, and remediation. If malware is found, the host (via Sucuri) takes the responsibility of removing it so you don’t have to worry about it. Additionally, most hosts (any one worth using, that is) also scan for advanced threats, including conditional malware and the latest cyber intrusions. This should all be included as part of your hosting plan. Adequate website security shouldn’t be an add-on that you pay more for, or something you have to completely rely on third parties for. Strong security should be a standard part of any web hosting package, so make sure you have it. Create a recurring calendar or to-do list item that reminds you to check every other week for WordPress, plugin, or theme updates. If you don’t already know, ask your hosting provider how they are protecting you from DDoS attacks and malware injections. You may need to put in a support request, or find the answers in your host’s knowledge base or documentation. I hope those options help direct your next step for today. Let’s keep building powerful, successful, and secure WordPress websites together. Need recommendations for hosting and security providers? Then you need to check out The Copyblogger Guide to the Best WordPress Tools: Hosting, SEO, Security, Plugins, and More. What WordPress hosting is the best choice for your site? What kind of security precautions do you need to take? What SEO plugins and services should you purchase? What other tools and plugins do you need to spread your words, build an audience, and drive business results? On this page page, we’ve distilled our best, most current WordPress recommendations, to answer all these questions and more. If you’re going to use WordPress to build an audience or support a business, this is your one-stop-shop for all the basic tools and services you absolutely must have. I think it’s fair to say that we all think about website security to “some” extent and the reality is that it’s getting more and more cumbersome for all of us with blogs and businesses that we’re trying to operate online. We must provide our visitors with a pleasant experience and not one whereby they are being bombarded with things that aren’t related to your blog. As you mentioned in your post, I completely agree. Don’t make the visitor think twice about your website because of what’s transpiring while they are there on the page they’ve navigated to. When you instill a sense of fear in the visitor about something unusual going on, trust me.. they aren’t coming back. Additionally, being mindful about your hosting provider is a great piece of advice and connecting that to a mindset of the strength of website security is extremely important and not something to dismiss. It can be the difference between protecting all of your hardwork or losing it all due to poor security or attention to it in the first place. With that said, to basically piggyback off of what you’ve mentioned regarding protecting your website against DDoS attacks and your mentions regarding plugins and themes, looking at WordPress plugins that focus on beefing up your basic WordPress security like adding a firewall and bruteforce protection will be extremely valuable assets to your overall blog security. Thank you for this article. One area I would mention is to update to a different theme if the one being used has not been updated in a while. WordPress sites, while an extremely great CMS, are a playground for malicious activity. People will find holes. Having experienced a hack myself, I think that these recommendations can not be stressed enough. Every site owner, WordPress or not, needs to take advantage of security tools that are available either through the hosting provider or plugins. You don’t want to find yourself blacklisted from Gmail because someone hacked a vulnerable theme to spam email through your account. I think the advice given in #3 is really good advice. A lot of WordPress website owners out there are totally unaware of the risk posed by using different plugins that have been knocked together without considering security issues. Not only are they unaware of the risk but they are totally unaware that they need to be keep these plugins updated regularly. In relation to #1, something else to add here is to find a hosting company that can provide seamless backups and restores. When all else fails and your site has been hacked then you need an easy way to get the latest clean version back up there. Thanks for these website security tips. Many security problems are often due to a lack of attentiveness. If you don’t take your security seriously, you are vulnerable to an attack, and it doesn’t matter if you’re a large ecommerce store with thousands of customers, or if you’re a small-time blog with only a few hundred readers.